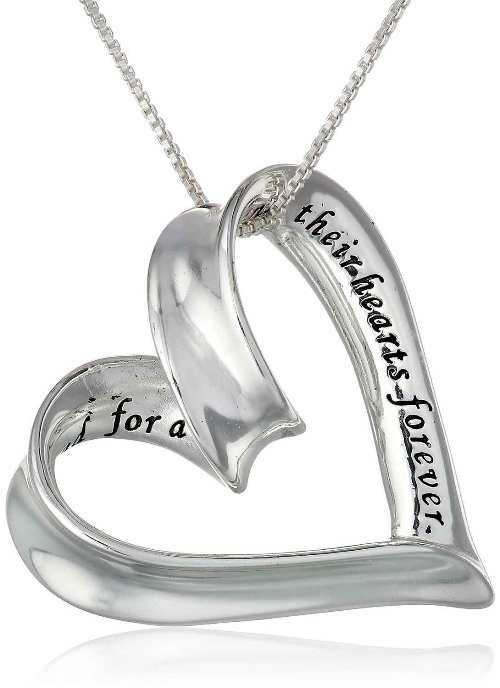 Celebrate the special bond between a mother and child with this sentimental sterling silver heart pendant necklace. The design of the pendant is ribbon loop type and engraving with “A mother holds her child’s hand for a short while and their hearts forever”. This heart pendant necklace is very shiny, sturdy and well made. The length of the chain is 18 inches. Though the chain is thin but it is well made and durable. Some person may like long chain; if you are liking long chain then you can buy a separate chain. You can purchased this for your mother or daughter as a Mother’s Day. The drawback is that the engraving lettering is incredibly hard to read.